The Hungarian-developed and produced 42 M. hand grenade, and the later 42/48 M. variant, became the primary weapon of its class for the Hungarian armed forces from the late phase of the Second World War until the early 1990s. Its reliable, easy-to-manufacture construction and the versatility of employment against a multitude of targets made it a very popular hand grenade with the troops. Whilst it never experienced the level of proliferation of the Soviet F1 and RGD-5, or the Chinese Type 67, the 42/48 M. is still occasionally found in conflict zones today. The Royal Hungarian Army entered the Second World War equipped with a multitude of domestically-designed and produced hand grenades. While reliable and effective in combat, all of these designs made use of impact fuzes. In late 1941, reports from troops operating in the Soviet Union filtered back to the arms department in Hungary, requesting grenades fitted with a delay (time) fuze that would not detonate when accidently thrown against branches in heavily wooded areas, and would provide reliable functioning when landing on soft snow or soil. The impact fuzing also limited the effectiveness of then-fielded grenades when thrown through windows or hatches of combat vehicles, as a significant impact was needed to function the fuze. The procurement department reacted swiftly and tasked the designer of the extant 36 M. hand grenade, Zoltán Vécsey, with the development of a new weapon that featured a time fuze. Captain Vécsey had already worked on several novel ideas and presented his unique hand grenade design in mid-1942. Brief trials gave very positive feedback, and production was ordered shortly thereafter. As with other weapons designed during this time, Hungarian industry struggled to gear up for production of the new device. Designated the 42 M. kézigránát (hand grenade), the contract for production was given to companies such as Elzett Vasárugyár Rt. (Elzett Metal Manufacturing stock Company), an enterprise already heavily involved in the war effort as a supplier for Messerschmitt. Deliveries began in 1943, but it was not before early 1944 that large quantities reached the troops on the front. The 42 M. was instantly popular with Hungarian soldiers, the time fuse giving troops more employment options. Interestingly, it was never intended to replace the other former designs but rather compliment them, allowing the operator to pick the right tool for the task. Production continued into late 1944 until the manufacturing sites were all captured by Soviet troops. After the Second World War, the newly-formed Hungarian Armed Forces lacked the basics to equip a fighting force. While other countries such as East Germany made extensive use of the weaponry produced in wartime Germany, Hungary was very reluctant to use these weapons and replaced them as soon as practicable with supplies of Soviet origin. Hungary undertook license production of Soviet weapons in substantial volume, from 1948 onwards. One of the few designs that remained of domestic origin and that was placed back into production was the 42 M. hand grenade, renamed the 42/48 M. This unusual move was made by the Hungarian government as the Soviet Union was not willing to provide a license for any hand grenade design. Production of the 42/48 M. was allocated to the Fémtömegcikk Művek, whose logo FTM can be found on top of the grenade warhead, together with the last two digits of the year of manufacture (see FIgure 1.1). During the first year of production, a significant quantity of WWII-dated parts were used to assemble new grenades, combined with newly-produced components. The yearly output in 1951 was 3,572,000 pieces, and a cumulative 12,185,000 hand grenades had been produced by 1952. In subsequent year, production numbers dropped dramatically, and production wound down before ceasing in the mid-1960s. The only significant update the 42/48 M. experienced was the introduction of the SV-54 fragmentation sleeve in 1958, which substantially improved the performance of the hand grenade in the defensive role by adding partially pre-fragmented fragments in a circular arrangement. Figure 1.1 Markings on the head of a 42/48 M. HE hand grenade. Note the ‘FTM’ logo for Fémtömegcikk Művek, and the ’52’ indicating production in 1952 (photo credit: Kristóf Nagy/ARES). The 42/48 M. hand grenade saw frequent combat use during the Hungarian Revolution and struggle for freedom in the fall of 1956. Surviving reports by participants in the fighting on the Hungarian side state that the grenade was used successfully in both roles (attack and defence) and was often employed to blow off tracks from armoured vehicles to immobilise them. The enormous stockpile produced in the early 1950s lasted the Hungarian Armed Forces for decades. In 1990, the need for a new hand grenade became obvious. 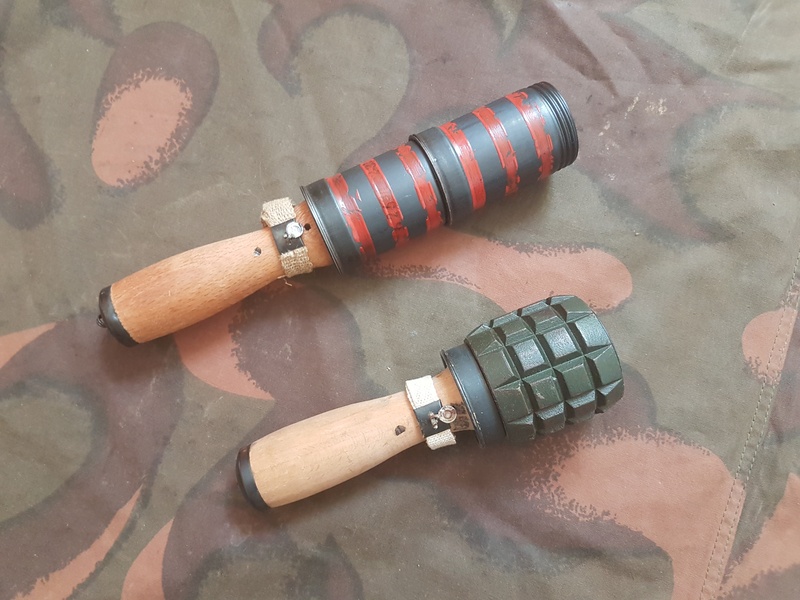 The Hungarian Armed Forces successively replaced their 42/48 M. grenades with the new 93 M. NF and 96 M. NF hand grenades that remain in service today. 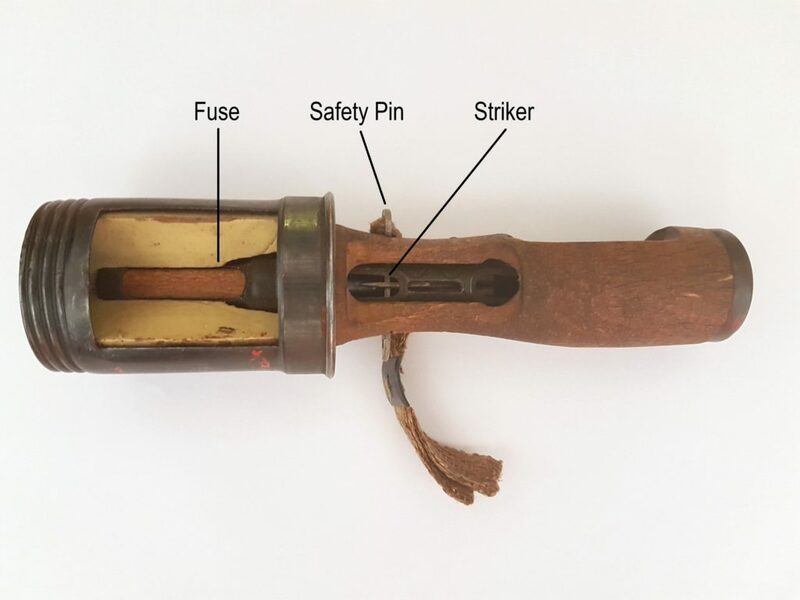 The 42/48 M. hand grenade is of the ‘stick grenade’ type, consisting of a metal-cased high explosive warhead, a wooden grip, a pyrotechnic time fuze, and a safety pin, the latter secured with a textile band and a transport seal (see Figure 1.2). 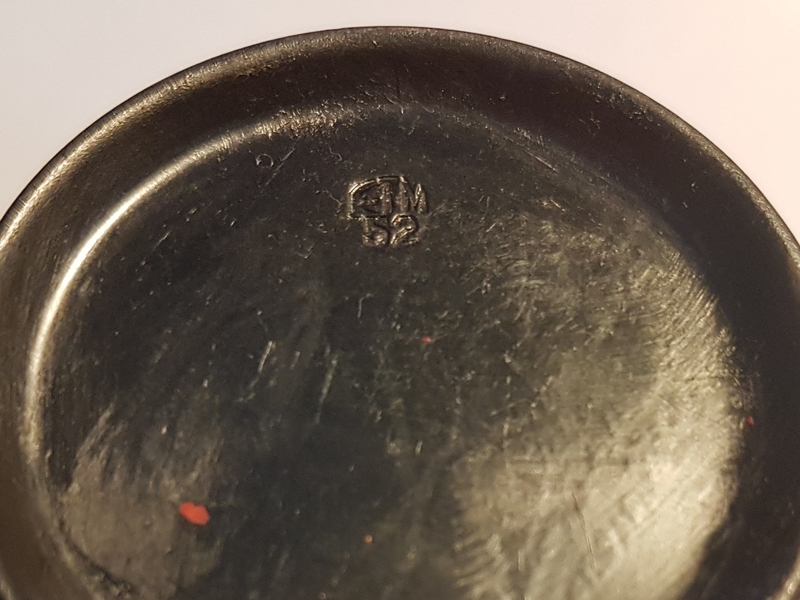 A metal striker firing ring is affixed to a cap at the base of the grip. 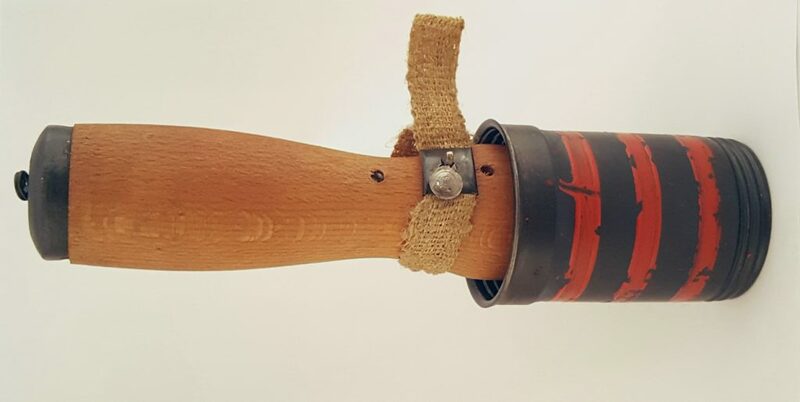 The mechanical components of the grenade are located within the wooden grip and in the separate fuze. The metal ‘head’ of the grenade contains no operating components. Figure 1.2 A disassembled 42/48 M. HE hand grenade (photo credit: Kristóf Nagy/ARES). 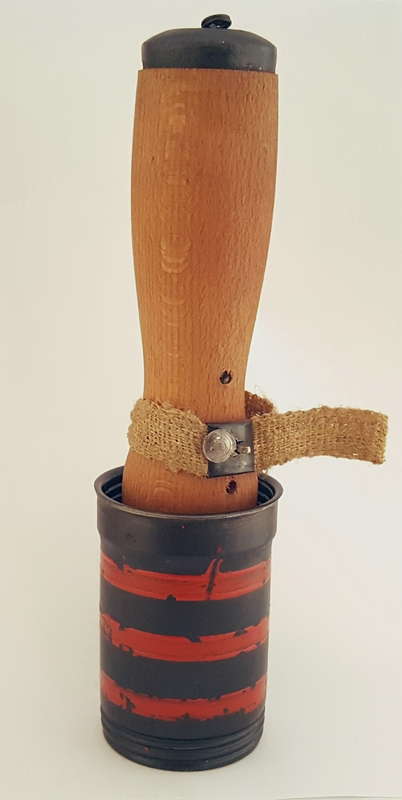 Contrary to most stick grenade designs, the wooden handle is not fixed in place, but is mounted on a tubular internal assembly, and held under pressure against the head of the grenade by two springs at the base of the internal assembly. The safety pin blocks the movement of the wooden handle and the striker, also covers the percussion cap. Once the safety pin is removed, the handle is free to move against spring pressure. The striker is also pushed out of a recess in the base plate and moves into a centred position. It is locked into place by a flat surface on the very same plate. The pyrotechnic time fuze is made from two aluminium tubes joined at their mouths to make a waterproof seal, and filled with propellant. These are sheathed inside a wooden jacket. The fuze will burn for 3.5 to 4.5 seconds until it ignites the detonator that itself will bring the 120 grams of TNT filler in the grenade head to explosion. The 42/48 M. is packed in a box with 30 grenades and 30 separate fuzes, ten of the latter packed in each of three waterproof boxes. Prior to combat use, the head is screwed off the handle, and the fuze is inserted into the handle of the weapon, with the percussion cap oriented towards the base of the grip. It is of utmost importance that the safety pin is properly seated before the fuze is placed into the handle. The fuze will protrude out of the handle when fully seated, and this will fit into the cavity in the warhead as the weapon is reassembled. Live grenades will come with a seal on the safety pin to ensure proper seating. To avoid malfunctions the head has to be tightly screwed back onto the handle. If not, the striker may not be able to reach the percussion cap. To ignite the fuze, the seal on the safety assembly is broken and the operator grabs the textile band and pulls the safety pin out of the handle. Once the safety pin has been removed, the grip assembly can either be pulled backwards and released, or the grenade is swung backwards using the inertia of the heavy head to compress the dual springs in the wooden grip. The complete backward travel of the stick against the springs is not more than 20 mm. 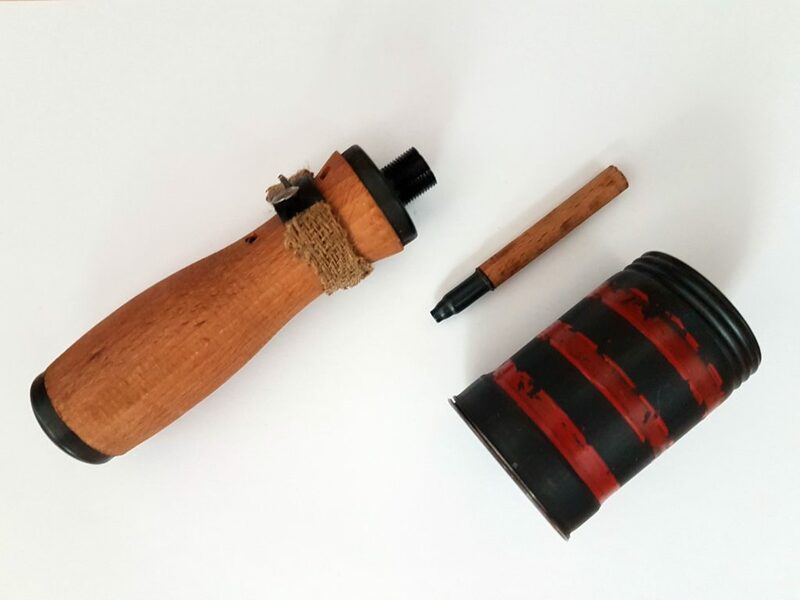 Once the grenade is thrown, and the wooden handle reaches its most rearward position, the two springs will push it forward and the striker will penetrate into the thin aluminium of the tubular inlay holding the fuze, striking the percussion cap (see Figure 1.3). If there is no opportunity to throw the grenade, the safely pin must be placed back into the grenade, with the textile band wrapped around the handle. The broken seal should be replaced with a piece of wire as soon as possible. Figure 1.3 A sectioned 42/48 M. HE hand grenade (photo credit: Kristóf Nagy/ARES). The grenade in its issued state (for the offensive role) weighs 344 grams and has a lethal radius of approximately 10 meters. In the defensive role, the same grenade can be fitted with an SV-54 fragmentation sleeve, increasing its weight to 744 grams and significantly increasing the lethal radius (see Figure 1.4, bottom). Multiple warheads can also be affixed to a single grenade handle. The threaded portion on top of each grenade head corresponds to a threaded portion under the metal jacket on the lower part of each head, allowing them to ‘stack’ linearly (see Figure 1.4, top). Unlike designs where multiple warheads are arranged concentrically around a central grenade (such as German designs in the First and Second World Wars), this arrangement allows for a line charge which is optimal for clearing barbed wire or other light fortifications. During the Hungarian Revolution, this arrangement proved to be very effective for immobilising tracked vehicles. Figure 1.4 A 42/48 M. HE hand grenade with two warheads assembled together (top), and a 42/48 M. grenade with SV-54 fragmentation sleeve (bottom) (photo credit: Kristóf Nagy/ARES). Such an arrangement needn’t be thrown, either. The spring-loaded ignition system of the 42/48 M. means that the ring-pull at the end cap of the grenade can be used to remotely function the munition. Before the removal of the safety pin, a wire or string is attached to the metal ring. Once the safety pin is removed, the user can now trigger the grenade from a remote position by pulling the string, or by attaching the grenade to a trip-wire to make a victim-operated device. The standard high explosive variants of both the 42 M. and 42/48 M. are marked with three horizontal red bands around the head of the grenade. The only visible differences will be in the different markings stamped on the heads of the grenades. 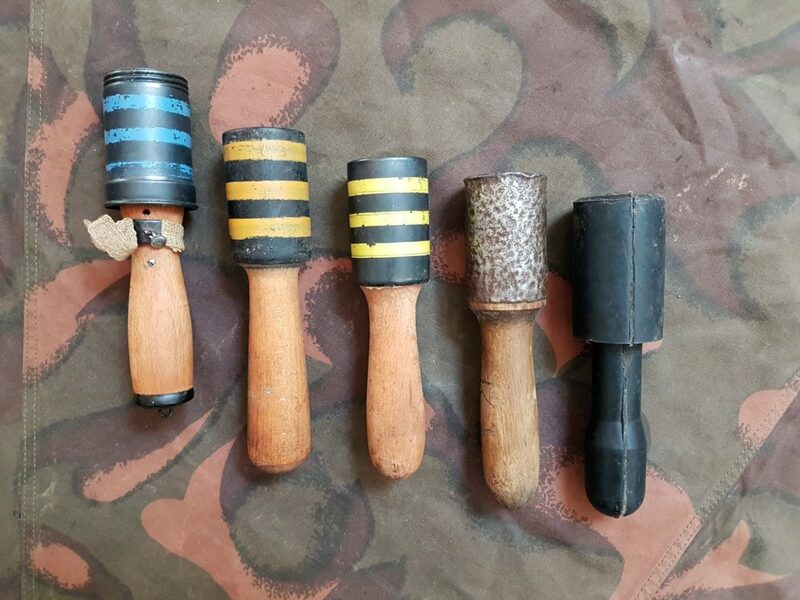 Of the training types discussed below, only the blue-banded models are stamped as per the HE types, as they used heads and handles taken from the same production lines as live grenades. This relatively expensive training tool was complemented by a much simpler inert grenade trainer that mimicked the shape and weight of the 42/48 M. hand grenade but was made from a sturdy material and contained no mechanical parts. These cheap devices were intended for throwing practice and are marked with three horizontal yellow bands (see Figure 1.5, centre left). Figure 1.5 Simulated training hand grenade (blue bands), throwing practice training hand grenades (yellow bands), improvised throwing practice hand grenade (hammered sheet metal), and 1970s-era rubber throwing practice hand grenade (black) (photo credit: Kristóf Nagy/ARES). 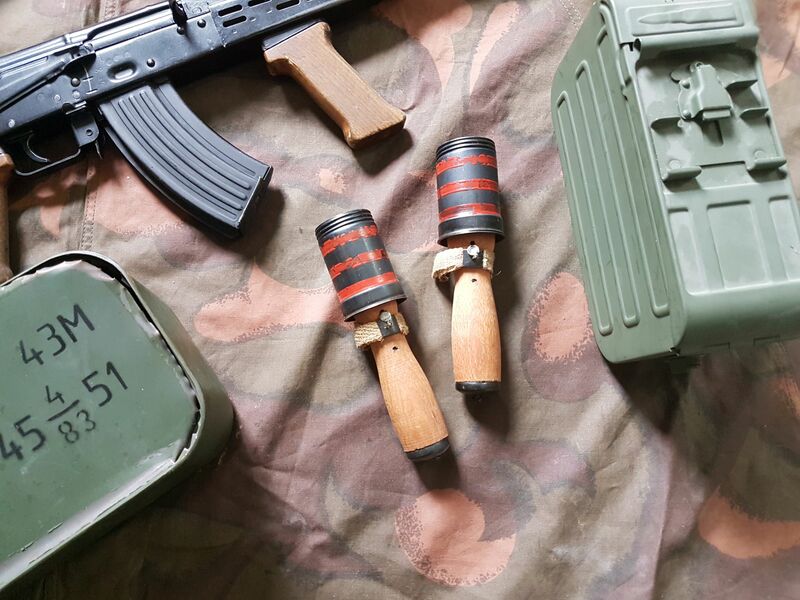 Surprisingly, these cheap training models seem to have been in comparatively short supply, and numerous craft-produced versions appeared over the years, manufactured by workshops within the Hungarian army to fill the need. These rough tools sometimes had grenade heads filled with sand, or metal jackets made out of sheet metal and hammered into shape (see Figure 1.5, centre right). To rectify this shortage, an official black rubber version with a metal core appeared in the late 1970s and was widely used for throwing practices (see Figure 1.5, right). A live 42/48 M. hand grenade is seldom encountered outside of Hungary, with only limited examples seen recently in Syria and Yemen. There is very little literature available about the unique function and history of the weapon, and almost none of that is in English. As a result, the 42 M. and 42/48 M. grenades remain poorly understood outside of Hungary. The 42/48 M. hand grenade was phased out of service with the Hungarian Armed Forces by the middle of the 1990s, with most of the stocks destroyed. A substantial number were rendered inert and sold as collector items. The design of the grenade is obsolete by modern standards. It is needlessly complicated for a grenade with a time fuze, and stick type grenades are rarely used in modern combat due to the poor ratio of explosive fill to overall volume. While the SV-54 fragmentation sleeve increased the capability of the grenade in the late 1950s, its fragment dispersion is not concentrated enough compared to modern grenades. Therefore, the 42/48 M. remains an interesting but rather exotic weapon that had little effect on other designs except for the Swiss HG 43 grenade that incorporated some features of the Hungarian concept. Anyone encountering a live grenade should seek EOD support in handling the device. The operation of the grenade is poorly understood and may increase the risk of a deadly error. Figure 1.6 Hungarian 42/48 M. HE hand grenade (photo credit: N.R. Jenzen-Jones/ARES). András Hatala & Ferenc 2003. Jegyzetek a katonai robbanótestek szerkezetének és működésének megismeréséhez és megértéséhez. Tóth Imre. 1972. Az Elzett-gyár története. Pál Germuska. 2014. A MAGYAR KÖZÉPGÉPIPAR: Hadiipar és haditechnikai termelés Magyarországon 1945 és 1980 között. Central Intelligence Agency. 1957. Techniques and Weapons Used by Freedom Fighters/ Encounters with Hungarian Army, Security Police, Soviet Army During Revolution. Munkásörség Országos Parancsnoksága. 1980. Kézikönyv, az alegységparancsnokok felkészülésehez. Honvédelmi Miniszerium. 1951. Utasitás és anyagismeret a kézigránátok és gyujtópalackok számára. Easy to read and excellent reference article . But is there a grenade with three “gray” lines , or has the blue colour deteriorated? Nick, thank you for the kind comment. There is no ‘gray’ marked grenade in the article. The blue colour appears quite vibrant on our monitors. Did the Hungarians use any rifle grenades during WW2? if so were they licensed/supplied German weaponry or old AH army stocks?